If you're a makeup fanatic like myself, you'll probably have heard of British makeup artist Pat McGrath. If you haven't heard of her, you will most definitely have seen her work at some point. It's no surprise, as it seems to be a continuous trend with successful makeup artists, that she started her own range of products two years ago. However in true Pat McGrath fashion, she didn't do it the usual way, instead she began her line with Gold 001, a single pigment sold as a kit with a spatula, mixing liquid and a container. She has since released limited runs of eyeshadow kits, highlighting kits and lip kits and most recently the MatteTrance lipsticks. I've been so tempted to buy her products before, but they're incredibly hard to get hold of here in Ireland. When I saw her first posting about the MatteTrance lipsticks on her Instagram I decided I'd have to treat myself (for my birthday) and buy one. It definitely wasn't difficult to decide on a shade, despite there being a selection of nine beautiful shades, my heart was set on Elson, a classic blue toned red. I placed an order from Sephora on the day they launched. There are a few options available when buying online from Sephora in Ireland. You could use the likes of Address Pal or My Mall Box which both create an address for you to ship to in the US and then subsequently, ship your package to Ireland. I'm not sure about Address Pal, but I know with My Mall Box you can amalgamate your orders from several US websites and have them all shipped to Ireland together. There are great advantages to using these services, first of all it means there are so many brands and websites available to us here in Ireland that ordinarily wouldn't be, it also means you can buy in US Dollars which most of the time saves you money. I'll definitely be trying one of these services in the future to order from Sephora, but this time I actually ordered from the Sephora Canada site and paid in Canadian Dollars which was $52. 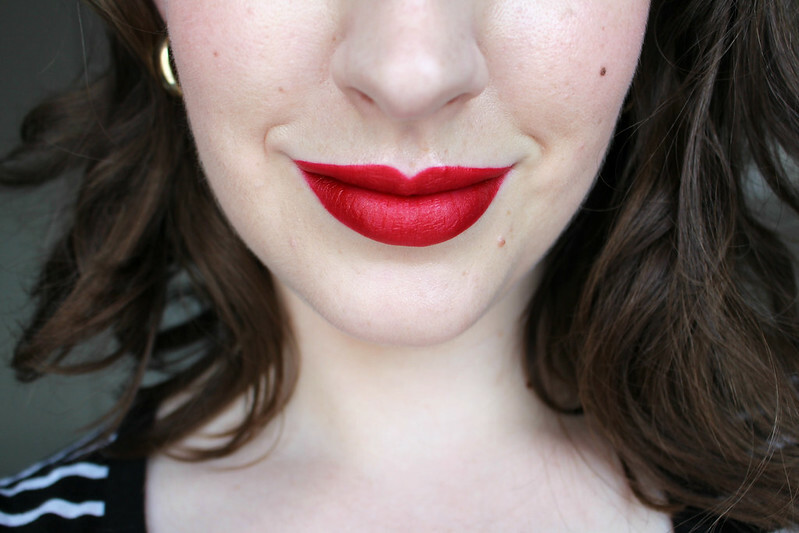 In USD the lipstick costs $38 so with the conversion it worked out at approximately €35. If I had ordered from the US Sephora, it would have worked out at around €31. So it was about the same price as a Charlotte Tilbury lipstick, not too extortionate in my book. Of course I don't live in Canada, but my brother does, so I had it shipped to him and he very kindly sent it on to me. When I was in New York I got a Sephora Beauty Insider Card and I had about 100 points on it so I got a free deluxe sample and three extra samples. There was another bonus perk for if you spend over C$50. I sadly missed my birthday bonus gift by about a week but there's always next year. That whole ordering portion of the post might not be of interest to you, but hopefully some of you will find it helpful for future reference. Now for the best part, the lipstick itself. 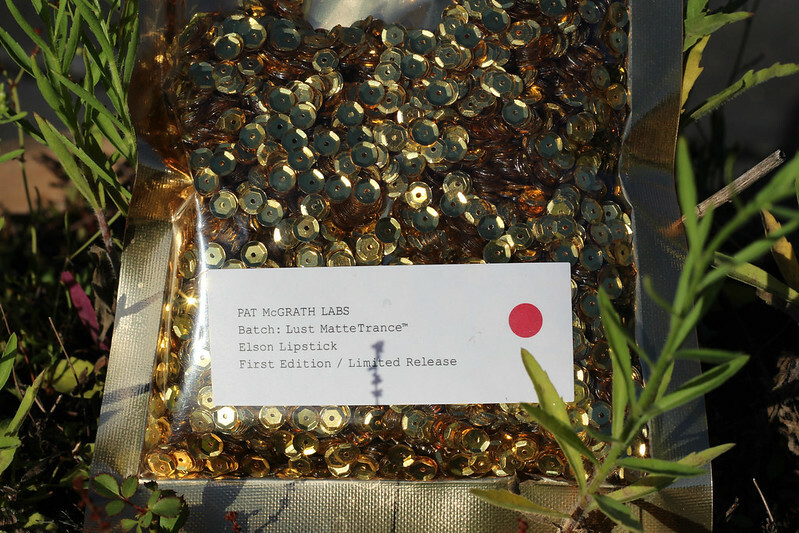 I have to admit, when I first saw how the Pat McGrath Labs products were packaged I was incredibly excited to get my hands on them some day. 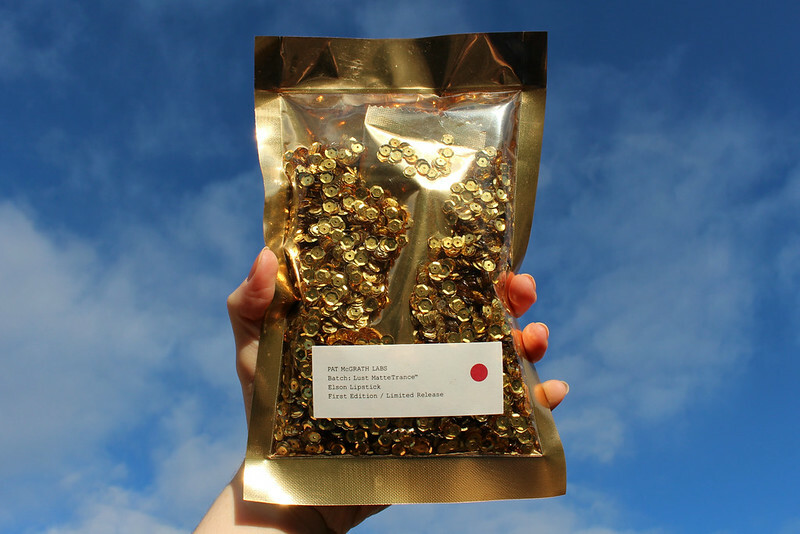 I absolutely adore the way they are packaged inside a bag of sequins. It's such a unique and over the top way to package a product but I love it. Once you open the packet and try not to spill the sequins everywhere which I was entirely unsuccessful at doing, you are presented with one of the most gorgeous lipstick cases I've ever seen. 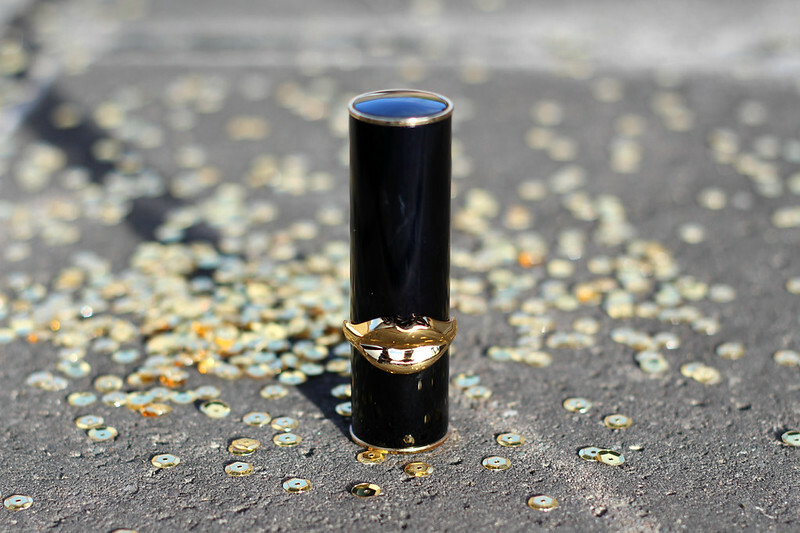 As you can see below, it's a sleek black tube with gold trim and gold lips. Another unnecessary detail, but one that lipstick lovers will most definitely appreciate. 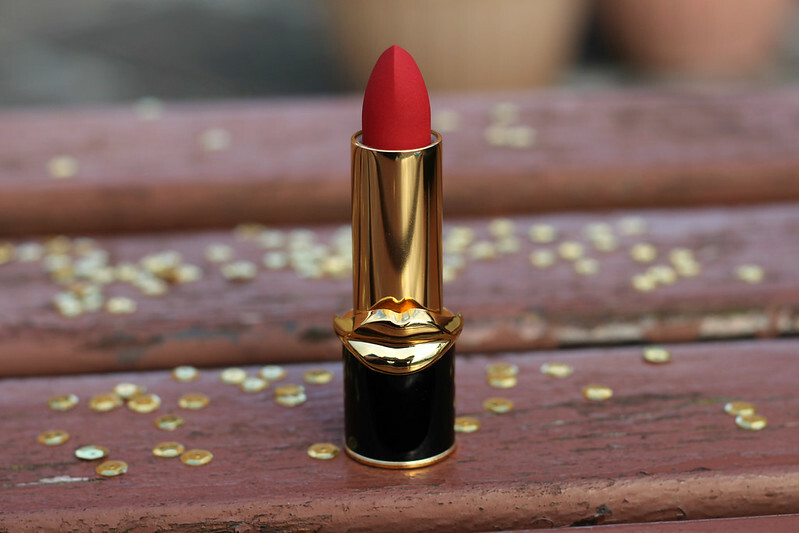 As much as I'm not fussed about packaging once the product is great, if I'm spending over €30, I do expect the packaging to be something special and this lipstick is just that, truly unique and beautiful. Pat McGrath doesn't do things by halves and her love of makeup, particularly extravagant and over the top makeup, is glaringly apparent with the way in which she has designed her products. So much thought has gone into every last detail. As you can see Elson is such a stunning shade. I went for red because I know no matter what I'll wear it. 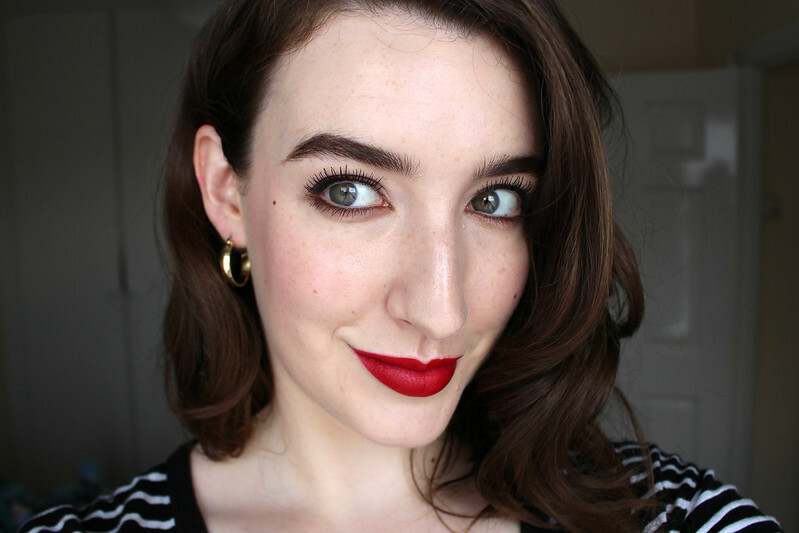 As for the texture, I was of course wary with it being a matte finish lipstick because it can go either way, however matte formulas are improving all the time and we've come a long way from the drying, difficult to apply MAC matte formula (even though I still love and wear Ruby Woo all the time). I can honestly say this was the most smooth and easy to apply matte lipstick I've ever tried. It glided on easily and the pigmentation is so rich you only need one layer. Like with most pigmented lipsticks I used a lip brush to perfect the edges and because the formula is so smooth it was easy to do as it didn't drag on my skin. 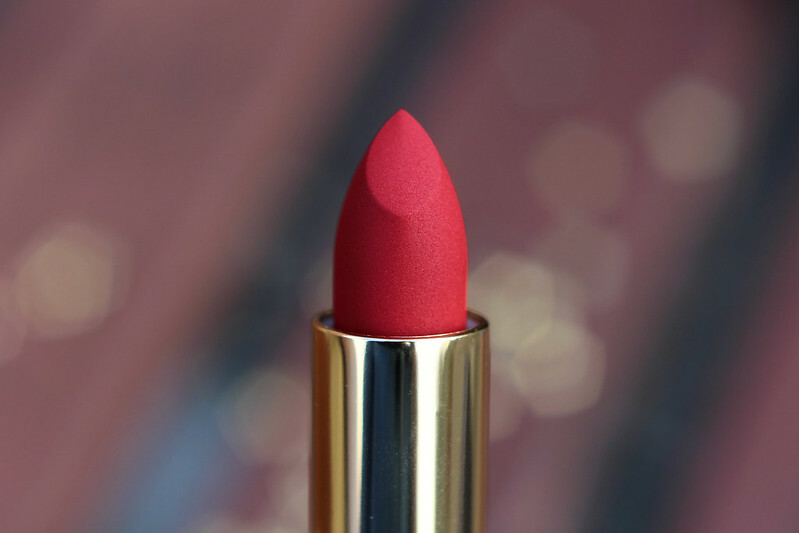 Although it's matte, it definitely doesn't look too dry, it has a sheen to it that gives dimension so that your lips don't look flat. I absolutely love the shade, it's a true blue red which of course is such a flattering shade of red because it supposedly makes your teeth look whiter. I also feel like everyone can wear a blue toned red, not matter what your skin tone or hair colour. As for lasting power, I did think that because the formula is a lot more smooth than the usual matte lipstick, it comes off a bit more easily. However I didn't wear a liner and I know that would help with the lasting power of it. The trade off though is that is it a lot more comfortable to wear all day than most of the matte lipsticks I own. It also doesn't have a scent which I know will please anyone with a sensitive nose. 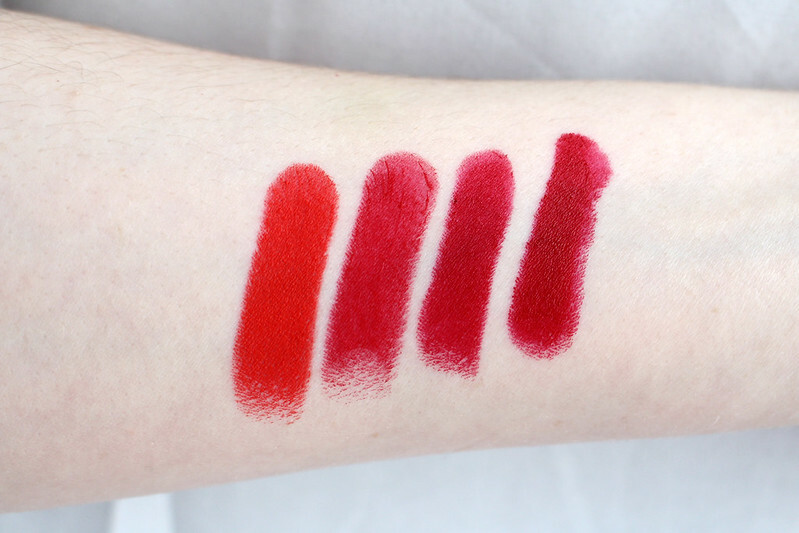 As you can see I swatched some comparable matte red lipsticks so that you have a frame of reference. Left to right is MAC Lady Danger, MAC Ruby Woo, Charlotte Tilbury Red Carpet Red and finally Pat McGrath Elson. As you can see Red Carpet Red is very similar, in both shade, finish and price point, so it's a great alternative if you can't get your hands on Elson. Did I need another red lipstick? Absolutely not, I have more than enough that I could probably wear it every day of the year and never run out. But, this was my birthday treat to myself and I was incredibly curious to try the Pat McGrath Labs products. The good news is, if you want to get your hands on these MatteTrance lipsticks which are currently all sold out, there is going to be a restock on the Pat McGrath website on September 16th at midnight EST and if you really want to guarantee you get one, there is a members only pre-sale happening beforehand if you sign up on her website. In other exciting news, she is launching an "unlimited" edition collection of products later this month including eyeshadow palettes, LuxeTrance lipsticks and lip liners which all look incredible. I highly recommend following her Instagram to get a sneak peak at the new products and just for some amazing makeup inspiration in general. 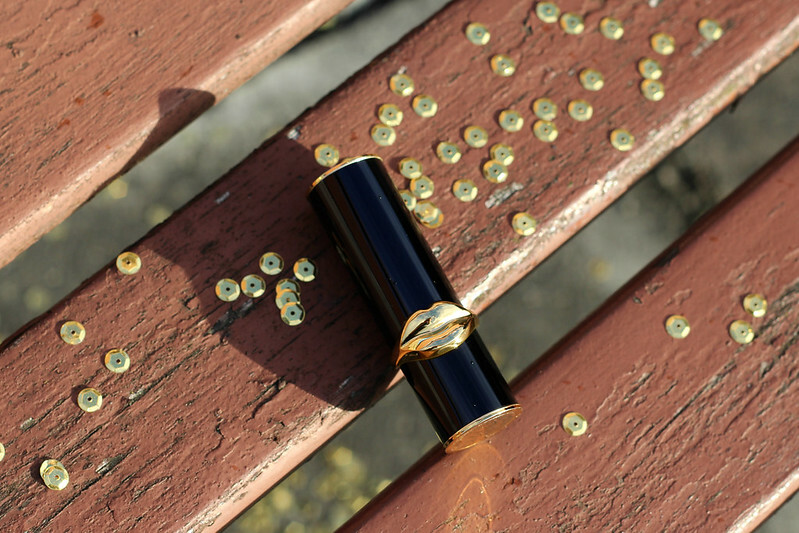 Pat McGrath Labs is available from Net-a-Porter and Sephora as well as the Pat McGrath website. Have you bought anything from Pat McGrath labs or would you like to?